NHL: Kevin Durant scored 29 points on 12-for-21 shooting, Russell Westbrook added 18 and Oklahoma City frustrated Miami’s offense all night on the way to a 96-85 victory over the Heat in Miami. 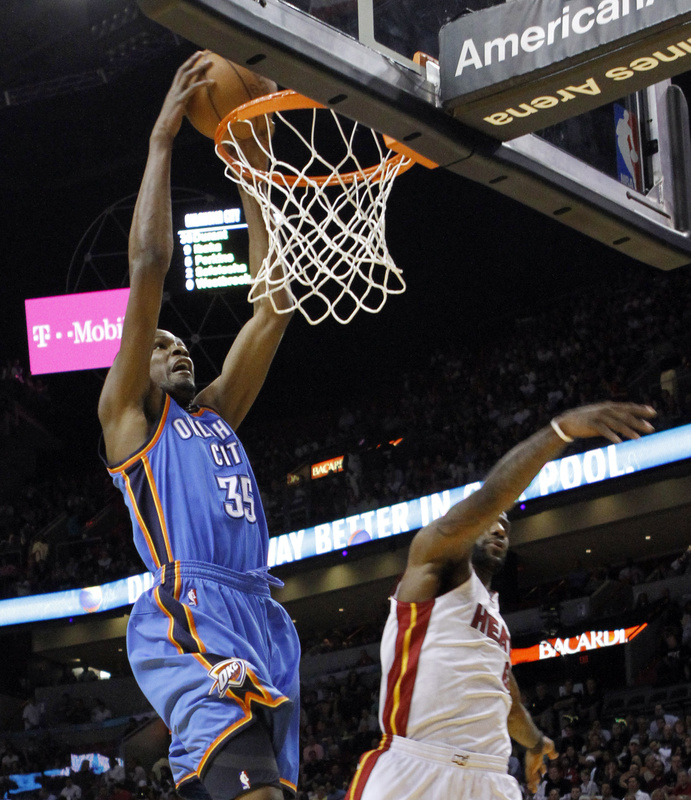 Oklahoma City shot just 40 percent, but it didn’t matter as the Heat were held to 38.5 percent shooting. Chris Bosh had 21 points and 11 rebounds for Miami, which had won three straight. • Howard helps Magic top Bucks in OT: Dwight Howard had 31 points and 22 rebounds to lead the Orlando Magic to a 93-89 overtime victory over the Milwaukee Bucks that wrapped up a winning five-game road trip. NHL: Henrik Zetterberg scored his second goal of the game with 10:07 remaining, and the Red Wings snapped the Washington Capitals’ nine-game winning streak with a 3-2 victory in Detroit. Brian Rafalski, who hadn’t played since Feb. 24 because of an injured back, had three assists. • Baseball: Marty Marion, the brilliant shortstop and 1944 National League MVP with the St. Louis Cardinals and a former manager of the Cardinals and St. Louis Browns, died Tuesday night in St. Louis. He was 93. Marion, who played on World Series title teams in 1942, ’44 and ’46, died Tuesday night in St. Louis, Cardinals spokesman Brian Bartow said. Minor league manager loses eye: Atlanta Braves minor league manager Luis Salazar has lost an eye after he was struck in the face by a line drive during a spring training game in Kissimmee, Fla., on March 9. He still expects to manage Lynchburg of the Class A Carolina League this season. • Bonds’ messages to mistress released: Federal prosecutors in San Francisco released transcripts and recordings of voicemail messages Barry Bonds left for his former mistress during their nine-year relationship. Most of the messages show Bonds angrily inquiring after Kimberly Bell’s whereabouts. Prosecutors say the recordings and transcripts are evidence of Bonds’ steroid use because the drugs supposedly induce rage in some users. NFL: Ray Anderson, the NFL’s chief disciplinarian, said that repeat offenders to the league’s illegal hits rule or players committing flagrant illegal hits will have a much greater chance of being suspended during the 2011 season. The league looks at two years worth of plays to determined repeat offenders. Rules defining a defenseless player will also be expanded. Miscellany: Lindsey Vonn took the lead from Maria Riesch in their duel for the overall World Cup skiing title, finishing fourth behind winner Julia Mancuso in the final downhill of the season at Lenzerheide, Switzerland. Vonn earned 50 race points for her lowest downhill finish this season, while Riesch failed to score after placing 17th. Riesch’s run left her 3.19 seconds behind Mancuso. Vonn took a 27-point lead over her friend and rival with three races left this week. • Mackey claims 16th at Iditarod: Lance Mackey, the four-time defending Iditarod champion, crossed the finish line in Nome, Alaska, nearly 24 hours behind first-time winner John Baker, in 16th place. • Tennessee will review Pearl’s job: Tennessee athletics director Mike Hamilton said in an interview with WNML-AM in Knoxville, Tenn., that he, the UT-Knoxville Chancellor Jimmy Cheek and school trustees will evaluate Bruce Pearl’s job as men’s basketball coach after the season ends. • Chancellor will step down: LSU women’s basketball coach Van Chancellor is stepping down and will serve as special assistant to the athletic director.